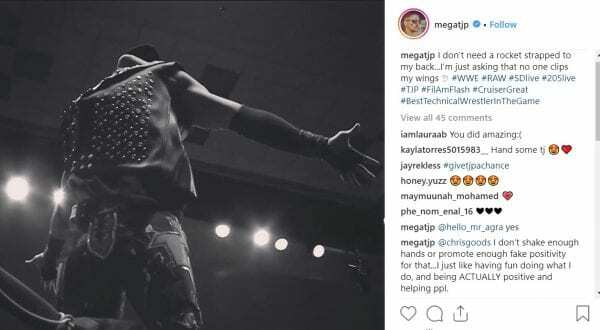 TJP recently threw a pretty big shot on Instagram, but it wasn’t in the actual photo he posted. Instead, it was in the comments section where he said that he didn’t “shake enough hands or promote enough fake positivity” to get a main roster call-up. Someone commented on a post from TJP saying, “Bring him to the main roster already.” TJP saw this and decided to throw some pretty interesting shots in his reply. He didn’t name anyone specifically, but how many 205 Live call-ups have there been recently? Someone is getting called out for spreading “fake positivity” by TJP.